Waste and recycling companies were highlighted at this year’s Australian Freight Industry Awards for their contribution to the national economy. Almost 700 members of the Australian freight, logistics and waste industry gathered in Melbourne to celebrate excellence in the Victorian Transport Association’s (VTA) Australian Freight Industry Awards (AFIA). The annual awards recognise excellence from transport operators, supplier companies and individuals across a range of categories to showcase the enormous contribution the industry makes to the Australian economy. Seven awards were presented on the night, with a brand new award to celebrate the efforts of the waste and recycling sector through the Waste and Recycling Award. Peter Anderson, Chief Executive Officer of the VTA announced the winners who were presented with their award by VTA President Cameron Dunn and Victorian Roads Minister Luke Donnellan, representing the Victorian Government and Transport for Victoria. 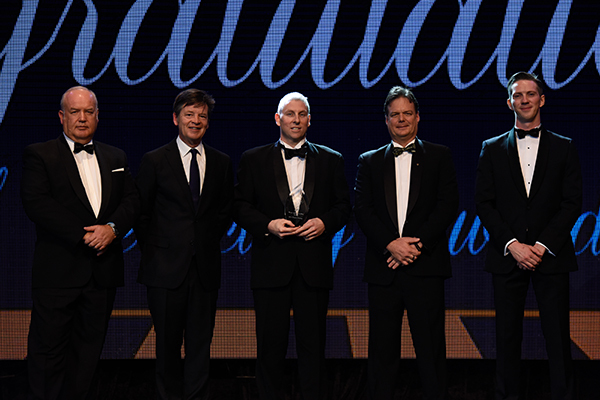 “The Australian Freight Industry Awards showcase the very best our industry has to offer and with dozens of high-quality applications received across the various categories, it’s clear the transport industry is committed to innovation, improvement and best practice,” Peter said on the night. One of the finalists announced for the waste award was the Melbourne International RoRo Automotive Terminal. The site was recognised by a range of accreditation schemes, including the Infrastructure Sustainability Council of Australia and the Green Building Council of Australia. Cleanaway was also nominated for the company’s South East Melbourne Transfer Station. As landfills begin to close, the station is set to handle the 450,000 tonnes of waste per annum that Melbourne’s south eastern corridor produces. It operates on more than 4600 square kilometres and will be run around the clock with a fully maintained site managing rainwater runoff, leachate tanks and filtrations systems. Recycling company Close the Loop’s innovative recycling processes saw it nominated as a finalist. The business’ strong partnership with construction company Downer has led to the development of a range of products, such as TonerPlas and Plastiphalt, that have seen recycled materials being used to create roads in Sydney and Melbourne. The winner of the evening was Alex Fraser Group which had been recognised for its efforts to turn waste into valuable infrastructure building material. With the Victorian Government requiring hundreds of thousands of tonnes in material, Alex Fraser’s recycling initiative has diverted more than 850,000 tonnes of waste glass from landfill to be used in the construction of new roads and infrastructure projects. One example of these materials being put to use in Victorian projects is the CityLink Tulla Widening project. The road carries approximately 210,000 vehicles per day which is estimated to increase to 235,000 by 2031. Alex Fraser was selected as the primary supplier of roadbase materials for the Bulla Road to Power Street section of the project and supplied 50,000 tonnes of class two, three and four crushed concrete, 40,000 tonnes of class three cement treated concrete and 60,000 tonnes of recycled capping. By using the recycled construction materials, the carbon footprint of building the road was reduced by 1000 tonnes.